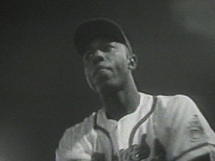 My fondest baseball memory occurred late in the evening on September 23, 1957, when Hank Aaron's 11th inning home run gave the Braves a 4-2 win over the Cardinals and secured Milwaukee its first pennant. I was 23 years old and sat in the upper deck. 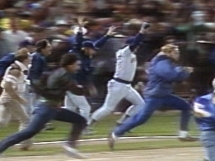 The pandemonium of that night was the culmination of the remarkable bond between the city of Milwaukee and the Braves. That was the greatest game I had ever experienced until October 10, 1982, when the Brewers won the American League pennant at County Stadium. It was a 4-3 game, and Pete Ladd got the great Rod Carew to ground out for the last out, which brought the pennant back to Milwaukee. After the Braves moved to Atlanta, we worked so hard to bring Major League Baseball back to Milwaukee. When Robin Yount's throw hit Cecil Cooper's glove, I felt that the Brewers had carried on the legacy of Hank's Braves in my hometown. That is a moment that will be forever etched in my memory. DP: 4. Mizell-Blasingame-Dark-Musial, Dark-Musial, Dark-Blasingame-Musial, Cunningham-H. Smith-Cunningham. E: Moon (9), Dark (25), Kasko (15). 2B: Musial 2 (37,off Burdette 2). SB: Boyer (12,2nd base off Burdette/Crandall). CS: Kasko (1,2nd base by Burdette/Crandall). HR: Aaron (43,11th inning off Muffett 1 on 2 out). GDP: Logan (14,off Mizell); Crandall (13,off Jackson); Adcock (7,off Jackson); Torre (12,off Muffett). IBB: Aaron (14,by Jackson); Crandall (9,by Muffett). IBB: Jackson (8,Aaron); Muffett (4,Crandall). Burdette (8,Noren). Umpires: HP: Hunter Wendelstedt. 1B: Brian Knight. 2B: Jerry Layne. 3B: Bob Davidson. CARDINALS 1ST: Blasingame grounded out (shortstop to first); Moon grounded out (second to first); Musial doubled to left; Noren was called out on strikes; 0 R, 1 H, 0 E, 1 LOB. Cardinals 0, Braves 0. BRAVES 1ST: Schoendienst singled to center; Logan grounded into a double play (pitcher to second to shortstop to first) [Schoendienst out at second]; Mathews grounded out (shortstop to first); 0 R, 1 H, 0 E, 0 LOB. Cardinals 0, Braves 0. CARDINALS 2ND: Ennis struck out; Dark was called out on strikes; Landrith grounded out (third to first); 0 R, 0 H, 0 E, 0 LOB. Cardinals 0, Braves 0. BRAVES 2ND: Aaron singled to left; Adcock singled to second [Aaron to second]; Pafko singled to right [Aaron to third, Adcock to second]; Covington reached on an error by Moon on a sacrifice fly [Aaron scored, Adcock to third, Pafko to second, Covington to first]; JACKSON REPLACED MIZELL (PITCHING); Crandall forced Adcock (shortstop to catcher) [Pafko to third, Covington to second, Crandall to first]; Burdette forced Pafko (third to catcher) [Covington to third, Crandall to second, Burdette to first]; Schoendienst popped to shortstop; 1 R, 3 H, 1 E, 3 LOB. Cardinals 0, Braves 1. CARDINALS 3RD: Kasko singled to right; Jackson was called out on strikes while Kasko was caught stealing second (catcher to shortstop); Blasingame popped to second; 0 R, 1 H, 0 E, 0 LOB. Cardinals 0, Braves 1. BRAVES 3RD: Logan grounded out (pitcher to first); Mathews grounded out (first unassisted); Aaron singled to center; Adcock reached on an error by Dark [Aaron to second]; Pafko grounded out (second to first); 0 R, 1 H, 1 E, 2 LOB. Cardinals 0, Braves 1. CARDINALS 4TH: Moon grounded out (second to first); Musial grounded out (third to first); Noren singled to left; Ennis singled to left [Noren to third]; Dark grounded out (third to first); 0 R, 2 H, 0 E, 2 LOB. Cardinals 0, Braves 1. BRAVES 4TH: Covington singled to right; Crandall grounded into a double play (shortstop to first) [Covington out at second]; Burdette singled to center; Schoendienst grounded out (third to first); 0 R, 2 H, 0 E, 1 LOB. Cardinals 0, Braves 1. CARDINALS 5TH: Landrith grounded out (second to first); Kasko flied out to center; Jackson popped to first in foul territory; 0 R, 0 H, 0 E, 0 LOB. Cardinals 0, Braves 1. BRAVES 5TH: Logan grounded out (shortstop to first); Mathews popped to second; Aaron walked; Adcock grounded out (pitcher to first); 0 R, 0 H, 0 E, 1 LOB. Cardinals 0, Braves 1. CARDINALS 6TH: Blasingame grounded out (shortstop to first); Moon singled to third; Musial doubled to right [Moon to third]; Noren was walked intentionally; Ennis popped to shortstop; Dark singled to center [Moon scored, Musial scored, Noren to second]; Landrith grounded out (second to first); 2 R, 3 H, 0 E, 2 LOB. Cardinals 2, Braves 1. BRAVES 6TH: Pafko grounded out (third to first); Covington grounded out (shortstop to first); Crandall singled to left; Burdette was called out on strikes; 0 R, 1 H, 0 E, 1 LOB. Cardinals 2, Braves 1. CARDINALS 7TH: Kasko grounded out (third to first); Jackson grounded out (pitcher to first); Blasingame grounded out (second to first); 0 R, 0 H, 0 E, 0 LOB. Cardinals 2, Braves 1. BRAVES 7TH: Schoendienst singled to center; Logan out on a sacrifice bunt (pitcher to second) [Schoendienst to second]; Mathews doubled to right [Schoendienst scored]; Aaron was walked intentionally; Adcock grounded into a double play (shortstop to second to first) [Aaron out at second]; 1 R, 2 H, 0 E, 1 LOB. Cardinals 2, Braves 2. CARDINALS 8TH: Moon walked; Musial singled to right [Moon to third]; SCHOFIELD RAN FOR MUSIAL; Noren reached on a fielder's choice [Moon out at home (shortstop to catcher to third to catcher), Schofield to second]; Ennis grounded out (shortstop to first) [Schofield to third, Noren to second]; Dark grounded out (third to first); 0 R, 1 H, 0 E, 2 LOB. Cardinals 2, Braves 2. BRAVES 8TH: CUNNINGHAM REPLACED SCHOFIELD (PLAYING 1B); Pafko grounded out (pitcher to first); Covington grounded out (second to first); Crandall singled to right; Burdette reached on an error by Kasko [Crandall to second]; Schoendienst popped to first in foul territory; 0 R, 1 H, 1 E, 2 LOB. Cardinals 2, Braves 2. CARDINALS 9TH: Landrith singled to left; BOYER RAN FOR LANDRITH; Boyer stole second; Kasko grounded out (pitcher to first) [Boyer stayed at second]; KING BATTED FOR JACKSON; King flied out to center; Blasingame grounded out (shortstop to first); 0 R, 1 H, 0 E, 1 LOB. Cardinals 2, Braves 2. BRAVES 9TH: H. SMITH REPLACED BOYER (PLAYING C ); MUFFETT REPLACED KING (PITCHING); Logan struck out; Mathews grounded out (second to first); Aaron grounded out (shortstop to first); 0 R, 0 H, 0 E, 0 LOB. Cardinals 2, Braves 2. CARDINALS 10TH: Moon grounded out (second to first); Cunningham grounded out (second to first); Noren flied out to left; 0 R, 0 H, 0 E, 0 LOB. Cardinals 2, Braves 2. BRAVES 10TH: Adcock walked; DEMERIT RAN FOR ADCOCK; Pafko flied out to right; Covington singled to center [DeMerit to third]; Crandall was walked intentionally [Covington to second]; TORRE BATTED FOR BURDETTE; Torre grounded into a double play (first to catcher to first) [DeMerit out at home]; 0 R, 1 H, 0 E, 2 LOB. Cardinals 2, Braves 2. CARDINALS 11TH: CONLEY REPLACED DEMERIT (PITCHING); TORRE STAYED IN GAME (PLAYING 1B); Ennis grounded out (shortstop to first); Dark flied out to right; H. Smith was called out on strikes; 0 R, 0 H, 0 E, 0 LOB. Cardinals 2, Braves 2. BRAVES 11TH: Schoendienst flied out to center; Logan singled to center; Mathews flied out to center; Aaron homered [Logan scored]; 2 R, 2 H, 0 E, 0 LOB. Cardinals 2, Braves 4.